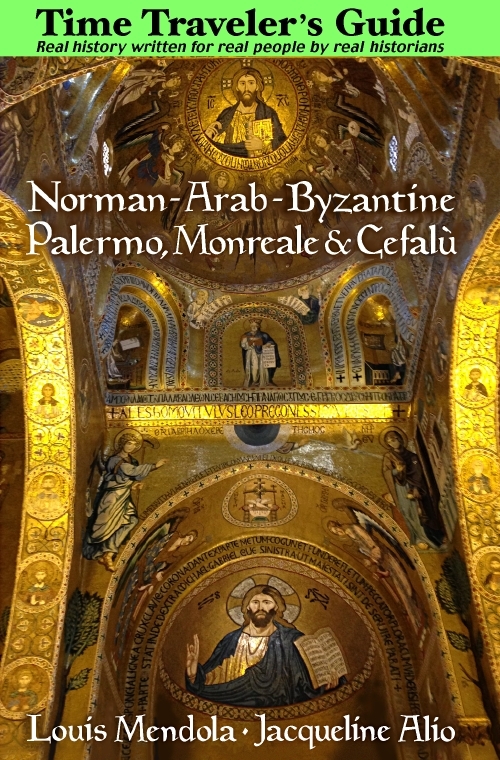 Maps and Charts of Palermo and Monreale - SEE PALERMO TRAVEL GUIDE. Personalized guided sightseeing in a timeless city. Tours of Palermo at your own pace. Welcome to See Palermo's "Map Room." Though designed primarily for viewing rather than printing, most of these simplified maps and keyed charts will print fairly well despite their low screen resolution, and the format of the pages linked here facilitates printing of images as well as descriptive legends. We pride ourselves on the clarity of certain maps and charts, especially those of old Palermo and the ones indicating the locations of specific mosaics in Monreale Abbey or the Palatine Chapel. Old Palermo. Things to see and where to see them. Probably our best general map for finding interesting places in the historical districts of Palermo, complete with links describing each thing. There's also a version specifically for printing. 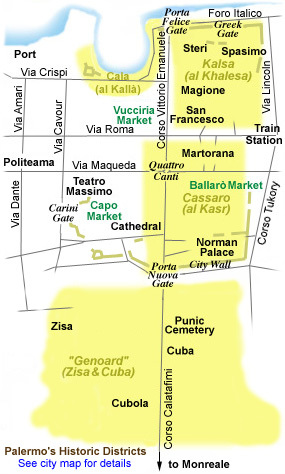 Palermo Punic and Medieval District Maps. This page includes the general map (shown here) featured on our home page indicating the Cassaro and Kalsa districts plus our map of Punic Palermo circa 400 BC. Monreale Mosaic Key. Please forgive our arrogance, but we believe this to be the most legible, practical --and printable-- chart of its kind (for Monreale) on the internet. In printed travel guide books (and their poorly-adapted "web versions") such charts are usually too full of "architectural" detail and therefore difficult to interpret. Some even contain errors! No problems with ours. Incidentally, for a euro or two you can usually purchase a large, detailed, bilingual (Italian-English) mosaic chart from the small book and post-card shop located in the cathedral's side portico, to the left as you enter through the gate. It has a red cover and is titled "Monreale schema grafico e pianta del duomo." Monreale Abbey Map. This simple map shows you precisely, quickly and easily where to find things in the cathedral and abbey complex. Monreale Cloister Capitals. This printable map explains the significance of some of the figures carved into the capitals of Monreale's cloister court. Though not complete, it does describe over a dozen of the more important figures. Palatine Chapel Mosaic Key. The format is similar to that of Monreale (above) but much smaller. The link takes you directly to the printable page. Northwestern Sicily Map. Hardly a substitute for a large road map, but still a good point of reference. Kalsa Map. The Kalsa (the Arabs' al Khalesa) is actually a small district near the coast but our maps extend it to include an entire quarter of the old city from Via Roma to the sea.